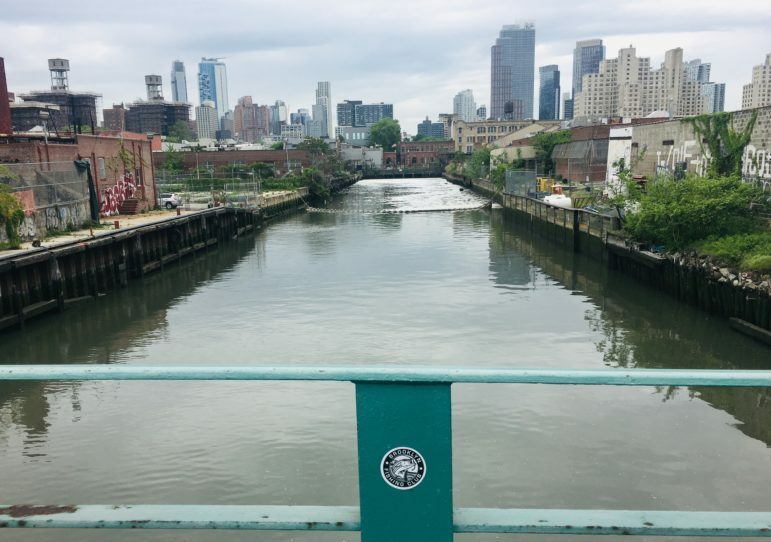 The city’s Department of City Planning unveiled its draft rezoning proposal for Gowanus Wednesday after over two years of discussions and meetings with the Brooklyn community that surrounds the Gowanus Canal. Some in the neighborhood greet the plan cautiously. Others say residents feel disillusioned by the plan but remain hopeful to negotiate for more amenities during the land use review process. Long-time residents, community groups and elected officials have been actively participating in the city’s rezoning discussions. Some have pushed to include NYCHA housing in the study area so they receive the benefits of the rezoning. Others have focused on a discussion about how to desegregate schools in their community. “As we move to transform Gowanus into an eco-friendly community for New York families and businesses alike, we seek to preserve and create affordable housing, protect and grow jobs and businesses, and clean up parks and waterways,” said DCP Director Marisa Lago. The planning process began in 2013 with Councilmember Brad Lander, who launched the Bridging Gowanus planning group before the DCP began its community engagement. Last year, the Gowanus Neighborhood Coalition for Justice (GNCJ), which includes local public housing and rent stabilized residents, industrial business, civic and nonprofit stakeholders, wanted the city to focus on five guiding principles for the rezoning plan; advancing racial and economic justice; creating real affordable housing and protecting tenants from displacement; promoting environmental justice; uplifting the culture and community and protecting local businesses. Both GNJC and Fifth Avenue Committee said they will comment on the draft rezoning proposal after the city’s presentation to the community in February (details of the date and location are below). The draft Gowanus rezoning proposal spans an estimated 80 blocks bounded by Bond Street to the west, Baltic Street to the north, 4th Avenue to the east from Pacific Street to 15th Street and cuts off near Hamilton Avenue in the South in the Southwest Brooklyn Industrial Business Zone. Along the Canal and near Thomas Greene Playground, zoning requirements and incentives would facilitate larger-scale mixed-use developments which include light industrial and repair-based businesses, nonprofit organizations, arts and cultural uses, and other job-generating uses. Publicly accessible waterfront open space also would be mandated in connection with private developments along the Canal. In the Fourth Avenue Corridor, the city proposes a C4-4D zoning for a commercial and residential mix of buildings which will be covered by Mandatory Inclusionary Housing (the levels of MIH have yet to be defined for the area). It will also include plans to make improvements to subway stations. In residential areas, such as Warren Street, the city will take a closer look at the existing R6 zoning where buildings can range from a single story to 13 stories tall. In the upland area, surrounding parts of the Gowanus Canal, the city proposes a mixed-use zoning of medium to light manufacturing and residential buildings. At the vacant city-owned site, at the corner of Smith and 5th Streets, known as Public Place, the rezoning aims to facilitate redevelopment for affordable housing and complementary uses in conjunction with the Department of Housing Preservation and Development (HPD). The city proposes a mix of new housing, including new permanently affordable housing, commercial, artist and maker space for the Canal corridor. It proposes the zoning for M1 districts to typically include light industrial uses, such as woodworking shops, repair shops, and wholesale service and storage facilities, according to DCP. For residential areas, it proposes a R7-2 zoning which are medium-density apartment buildings common in the Bronx and the Upper West Side. DCP says its waterfront access plan will take a closer look at existing requirements for public access and identify specific locations for required public walkways along the Canal, upland connections, supplemental public access areas and visual corridors. According to DCP, the rezoning package also includes remediation of brownfield sites to safely accommodate new development; requirements for “climate resilient” new development; creation of new community resources such as schools; subway station improvements; and Department of Environmental Protection (DEP) infrastructure upgrades, including recently-completed sewer construction as well as planning, design and property acquisition for infrastructure to reduce sewage entering the Canal. On the Industrial Business Zone, DCP said they will continue engagement with business owners of the area, which includes bringing infrastructure improvements and broadband to the area. The Gowanus Alliance, which supports businesses across Gowanus, including the IBZ, said in an email earlier this week that it supports a rezoning that respects the character of the community and that aids in ending the affordability crisis across the city, but it should include a path for job growth, “…part of that must include modest growth in the IBZ section so the jobs our community has come to depend on are available.” But the group said it will wait to comment on the draft zoning proposal until after the DCP presentation. DCP will continue public engagement beginning with an open house to share and gather feedback on the zoning proposal, to be held on February 6, 2019 at 6:00 p.m. at P.S. 32 317 Hoyt Street off Union Street. The next step will be the publication of the Draft Scope of Work for the Environmental Impact Statement, which will be followed by a public scoping meeting this spring to solicit comments to inform the environmental review. DCP said the official public review process will begin after the Draft Environmental Impact Statement and land use application are completed. The complete draft zoning proposal can be read here.